The Federal Reserve Chairman was sitting in his office contemplating the fantastic problem that he and the other fed governors were trying to solve. The Federal Reserve, since its inception in 1913, had never faced such a dilemma. Huge federal budget surpluses were likely to wipe out the federal debt in the next couple of years and the fed chairman was concerned how the Federal Reserve was going to control the money supply. Buying and selling treasury notes was one of the major methods the Federal Reserve used to control the money supply. Controlling the money supply was necessary to control inflation, ease recessions and deal with banking crises, such as 1930’s style runs on banks. The Federal Reserve buys treasury bills when they want to increase the money supply and sells treasury bills when they want to decrease the money supply. If the federal deficit was paid off, then the Federal Reserve would have difficulty using open market operations to control the money supply. The Federal Reserve could still alter the discount rate or the required reserve ratio of banks to alter the money supply, but open market operations have a more immediate. It was late in the day, and the Fed Chairman stretched and looked out the window. The sky was clear, stars were twinkling. His mind began to wander. He wondered how the US ever got into this situation. Sound money policies such as those started by his predecessor and continued under his chairmanship were partly responsible. In contrast, the inflation of the 1970’s had almost bankrupted the US economy by destroying people’s savings and causing them to speculate on hard assets rather than invest in productive enterprises. This resulted in the stagflation economy of the 1970s. To combat the high inflation of the 1970s his predecessor had raised interest rates until the prime rate was at 21.5%. This killed off inflationary expectations, but at a terrible cost in terms of jobs and one of the worst economic downturns since the 1930s. Sound monetary policies stimulated people to invest in productive enterprises, increased the saving rate, eliminated speculative investments in hard assets such as gold, and increased lending. The Fed Chairman congratulated himself that his policies had helped to bring about this current prosperity. Then he remembered that China in the 1970s had sound monetary policies keeping inflation under control and this by itself did not lead to strong economic growth. Clearly more than sound monetary policy was responsible. Fiscal restraint exhibited by the federal government in the late 1990s along with the peace dividend from the fall of Soviet Union was key in reducing the federal deficit. Of course the almost 64% (about 6.0% compounded per year) increase in federal receipts from 1990-1999 also contributed significantly. The reduction in the federal deficit brought down borrowing costs for private companies, which helped to expand the private sector. This economic expansion contributed to the 64% growth in federal revenues over nine years. However, federal spending only grew 46% (about 4.3% compounded per year) over those same nine years. This was significant because a number of states and municipalities did not show the same restraint and their budgets were growing at near double-digit rates in the late 1990s. The Fed Chairman had to admit that while fiscal restraint by the government was important to economic growth; it was not main cause. Ultimately, the private sector was responsible. The Fed Chairman thought to himself that some people might attribute the economic growth, which was ultimately responsible for his problem of how to control the money supply, on the natural resources of the country. While the US was blessed with abundant natural resources, the known natural resources of the US had not changed significantly since the discovery of and exploitation of the Alaskan oil reserve. The key to long-term economic growth and the growth of personal income, the Fed Chairman thought to himself, had to be innovation, particularly technological innovation. The technological driver of the 1990s was the digital economy, based on transistors. The digital economy was financed by venture capital. This combination of the digital economy and venture capital grew from the ashes of the 1970s economy. Then, the end of the machine and energy age gave way to the beginning of the information age. The pinnacle of the machine age had been the Apollo program, which pushed the limits of chemical energy sources to move machines. The Apollo program was the crowing achievement an age that began with the steam engine of the early 1700s. The steam engine was the first generally available replacement for human labor. There had been water wheels and windmills for years, but they were restricted to certain locations and could not generally replace human labor in all areas. The machine age had progressed from coal and steam engines to oil and internal combustion engines by the late 1800s. On the heels of internal combustion machines were followed by electrical power and electrical motors finding wide use in factories and in the home. Eventually, electrical power allowed a wide variety of machines to be used in the home, such as refrigerators, washing machines and dryers. Houses and factories were electrically lit. Automobiles were also a product of this technological wave and the first Model T rolled off the assembly line in 1908. Mass production started before the chemically powered machine age but profited from it. 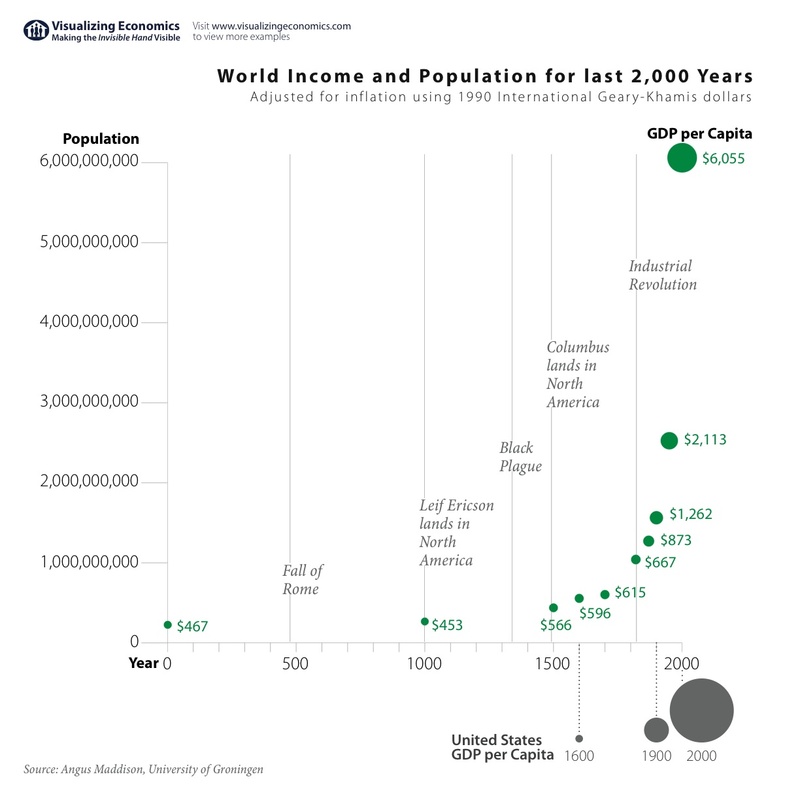 During the machine age, the population of industrial countries grew faster than at any time in History and real per capita income finally started growing after two millennium of being essentially stagnancy of around $700-800 per year in Europe. The machine age also saw a number of financial innovations that were necessary for its extraordinary economic growth. One of the most important being the beginning of modern banking. Now, this was a subject near and dear to the Fed Chairman’s heart. Modern banking started in the early 1600s with the Bank of Amsterdam. Merchants could deposit coins with the Bank of Amsterdam and use this account to pay for transactions. Using checks, a merchant’s account was debited and another merchant’s account was credited. This meant that coins did not have to be transported from one merchant to another with the attendant risk of theft and loss or the cost of transportation. The Bank of Amsterdam was just an exchange bank that facilitated transactions between merchants. Next came the Swedish Riksbank established in 1656. The Riksbank was not only an exchange bank, it also lent money making it the first modern fractional reserve bank. Fractional reserve banking is the banking practice in which banks keep only a fraction of their deposits in reserve (as cash and other highly liquid assets) and lend out the remainder, while maintaining the simultaneous obligation to redeem all these deposits upon demand. Commonly, loans are made against collateral such as land or jewelry. The Fed Chairman thought to himself that some people believed fractional reserve banking created money out of thin air, but what really happened was the money for these loans were backed by some collateral other than coins or bullion. The downside of other types of collateral is they are not as liquid as species (coins, bullion). As a result, if large numbers of customers of a fractional reserve bank wanted species (currency) at the same time, the bank would not able to fulfill all its customer’s demands. This is a classic run on a bank. A run on a bank is a cash flow issue. A sound bank may have plenty of collateral and performing loans, but if most of its customers demand species at the same time it will not be able to fulfill these requests. Fractional reserve banks free up capital from low performing assets so that they can be invested in higher performing assets. For example, if you owned a large tract of ranching land that was not highly profitable but represented a large amount of capital and you want to invest in an oil well, without fractional reserve banking you would have to sell some of the land in order to invest. With fractional reserve banking you could convert your land into a generally accepted form of money, by pledging your land as collateral to a bank for a loan. In the modern world, the loan to you is just a computer entry in your bank account. The next great innovation in banking was the joint stock company. The Bank of England was permitted to be a joint stock company starting in 1709. This allowed the Bank of England to sell shares in the Bank to raise capital. The advent of modern banking allowed for efficient transfer of money between parties without which the machine age would have been impossible. It also allowed unproductive capital from the agricultural economy to be converted into standard currency which in turn was invested in more productive machine age enterprises. The joint stock limited liability company was a key innovation of the machine age. These types of companies allow people to pool their resources taking on ventures that an individual investor wouldn’t have the money to capitalize on. In addition, the investors’ liability is limited to only the money they invested. As a result, investors do not have to worry that if the company fails they will become bankrupt. The first joint stock limited liability corporations were formed to run banks and to exploit the new maritime technologies that allowed spices and other goods to be transported to Europe for significantly less money than overland routes. It is often the case, the Fed Chairman mused, that advances in technology require advances in finance in order to fulfill their potential. That is the case with banks and joint stock limited liability companies. Financial and legal innovations were necessary to capitalize on the advances in maritime technology, also playing a critical role in advancing the machine age. By the 1970s, the machine age seemed to have played out. The romantic notions that everyone would be flying around like the Jetsons and have robots at their command, just seemed to fizzle out in the 1970s. The private airplane market that held such promise in the 1960s was almost dead by the end of the 1970s, because of the cost of litigation. The dream of supersonic airliners, only partially fulfilled by the European Concord became too expensive. The promise of cheap energy from nuclear power was killed off by regulations that created a number of white elephant nuclear projects. The US seemed to be losing its technological edge to the Japanese, as Americans’ switched from Detroit’s automobiles to Japanese automobiles. The US went from an oil producing country to an oil importing country. Out of the economic ashes of the 1970s, an embryonic version of the digital age was being created in Silicon Valley. The microprocessor was invented in the early 1970s and it was the key to the new digital information economy that would make the US the economic powerhouse of the world in the 1990s. However, in order for the digital information economy to fulfill its promise, it would need a new financial model. That financial model was venture capital financing. The way this model worked is a bright engineer or scientist came up with an innovation to further the digital information economy. He formed a company with other bright engineers who shared the equity. The company started working on the innovation, securing rights to the innovation by applying for patents and applying to a venture capital company for financing. Once venture capital financing was secured, management talent was lured away from large stable companies by offering a combination of a lower salary but with stock options in the company. If the company was successful, it either has an initial public offering, or was bought out by a larger technology company with similar goals. This provided a liquidity event for the venture capital firm so that the investors in the venture capital firm could finally be paid. The founders and management talent cashed in their stock or stock options and realized a financial reward for their innovation and risk taking. Commonly, the founders and management started new companies or funded others in the digital information space. This model was honed by the 1990s and drove unprecedented growth in technological innovation, resulting in the wealth that now was paying down the federal debt at a tremendous clip. While not all high technology start-ups used this model, all high technology companies used parts of this model and benefited from the model. It was clear to the Fed Chairman that the blame for the problem of how to control the money supply lay with the growth caused by the digital information economy. He marveled at the resiliency of the US economy to hatch the phoenix of the digital information economy from the ashes of the 1970s economy. Suddenly he had a sinking feeling in his stomach. He wondered if by identifying the engine of growth, had he doomed it to additional regulations and taxes that effectively stifling its innovation? Commonly, politicians to seize upon any new area of economic growth to raise additional revenue. For instance, all the state governments had wanted to tax the Internet as soon as it became an economic force. Politicians also have a tendency to start adding regulations on any industry that becomes too successful. A pundit once said of American government that it taxes and regulates any business that is profitable until it becomes unprofitable, and then it subsidizes it. The Fed Chairman stretched and yawned. Outside, large raindrops pelted against the windows. Niall Ferguson, The Ascent of Money, a Financial History of the World, The Penguin Press, New York 2008. Alan Greenspan, Alan Greenspan, The Age of Turbulence-Adventures in a New World, The Penguin Press, New York 2007. John Steele Gordon, Hamilton’s Blessing, The Extraordinary Life and Times of Our National Debt, Penguin Books 1997. T. S. Ashton, Louis Hacker, F. A. Hayek, W. H. Hutt, Bertrand De Jouvenel, Capitalism and the Historians, Phoenix Books, University of Chicago Press 1954. Ayn Rand, Capitalism: The Unknown Ideal, Signet Book from New American Library: Times Mirror 1946. Gregory Clark, Farewll to Alms, A Brief Economic History of the World, Princeton University Press 2007.